For the entire year of 2006, a small committed group of Mariposans, under the leadership of the pastor and a member of the Mariposa Lutheran Church, met weekly at 6:45 a.m. at Happy Burger to study the need and to build support for an affiliate of Habitat for Humanity International. The need for an affiliate of Habitat for Humanity to serve low-income families and individuals in our area was ascertained very soon in this process. The application process took another year during which fundraising and awareness building took place. Several events, including raffles, dinners, silent auctions, and talks to the Mariposa County Board of Supervisors, civic groups and churches, led to the building of a data base of volunteers, now numbering more than 500 names. In March of 2008, Habitat for Humanity of Mariposa County was recognized by Habitat for Humanity International as an official affiliate. In 2009 we received our first land donation from Howard and Joy Dudley of Garden Grove, California. The Dudleys donated five acres of their ten-acre parcel on Sebastopol Road. The lot split required a major road repair, and the new parcel was recorded in Habitat’s name on November 2, 2010. Since then, construction has begun on our first Habitat home in Mariposa County. The happy partner family for this first home is Wendy Sternberg and her three sons. HFH of Mariposa County is about to embark on a new program called A Brush With Kindness. This program will allow HFH of MC to help the elderly, disabled and other low-income homeowners to maintain their homes. Painting, minor repairs, and weatherization are among the projects being planned. 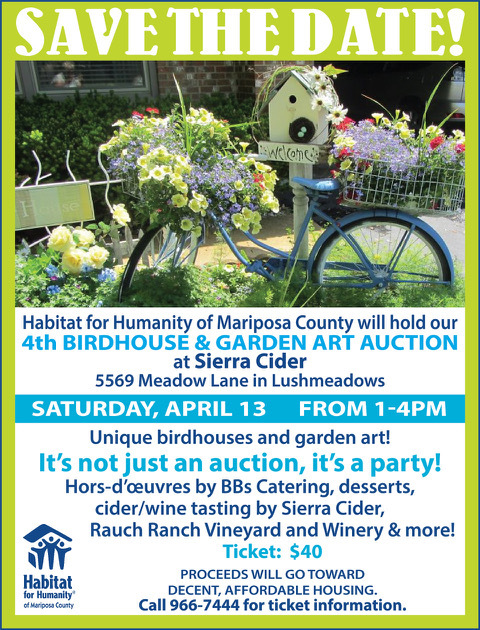 Major fundraising is ongoing, but between 2008 and 2010 HFH of Mariposa County was able to raise more than $80,000, an amount that was considered necessary to build our first home. In addition to the fundraisers mentioned above, HFH has had two successful art auctions and most recently the fun-filled Tour de Habitat bike-riding event. This event brought in around $9000 making it the best fundraiser to date. Individual and family donations, in particular from the C. Paul Johnson Family Trust, have greatly helped Habitat’s work here. Monthly pledges, unsolicited donations through PayPal, as well as grants from PG&E and Home Depot, have been gratefully accepted. We would not have an affiliate of Habitat for Humanity here without the generous support of local businesses and organizations.